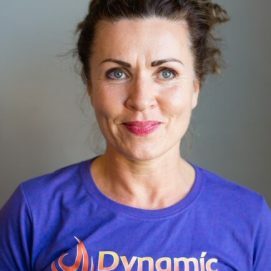 Carolyn started practising hot yoga in 2002 due to a foot injury that had stopped her from jogging and she soon found that it helped in healing her foot. But that was only the beginning as it brought Carolyn many more benefits including feeling relaxed and energised. From that first day, DHY has become a huge part of her life. She has always been interested in healthy living and health promotion and since leaving school has had a full career in nursing and midwifery. Her passion for yoga and holistic health has led her to complete the Dynamic Hot Yoga Teacher Training in 2018 and she is now looking forward to this new path of learning and developing her own teaching style. Carolyn feels passionately about the importance of breath and how focusing on relaxed, deep breathing throughout the yoga class, not only helps in achieving postures, but also enables an active meditation, resulting in feeling calm and ready for anything that life may throw at you!